With ancient buildings and bridges, awe-inspiring scenery of mountains and lakes, Lucerne is a picture-book city. Here are 10 things to do in Lucerne to put on your to-do list for your next Swiss vacation. A train trip to Mount Pilatus Kulm is one of the most spectacular things to do in Lucerne. Board the world’s steepest cog railway for a heady 30-minute journey to the top of Mount Pilatus Kulm. At 2432m high, it’s a journey you won’t forget. The 4618m-long railway is a steep but picturesque trip at a 48% gradient up the side of the mountain. Spend the night on top of the world at the Hotel Bellevue. While the hotel provides modest three-star facilities, the views are to-die-for. A few hours exploring the mountain trails will take you through some wonderful scenery. The easiest walk is the circuit through the Rock Gallery which winds past artwork set inside the mountain. However, on Pilatus, a view is never too far away with windows cut out of the rock to capture the expansive vista. The Oberhaupt and Esel routes provide spectacular 360-degree panoramic views of the alpine range where you will gaze at Switzerland’s famous mountains – the Eiger, Monch and Jungfraujoch. Enjoy the scenery above the forest from the gondola as you glide silently down to Kriens before catching the bus back into the centre of Lucerne. Both the cog-railway and gondola rides last for around 30 minutes. If you have a lot of luggage, it’s a good idea to pack a small bag and leave the bulky stuff in a locker at the Lucerne railway station. Mount Pilatus Kulm can be visited as a day trip from Bern but if you want to explore Lucerne itself you’ll need to stay a few days. Enjoy a romantic cruise along the shores of stunning Lake Lucerne. From Lucerne, the boat trip to Alpnachstad takes around 90 minutes and makes several stops on the way. Also known as the Vierwaldstättersee or “Lake of the Four Forest Cantons”, Lake Lucerne is surrounded by mountains. A trip on the lake is a relaxing way to soak in the fabulous scenery as you glide past picturesque towns, charming Swiss chalets and forests that stretch down to the shore. There are plenty of cruises to choose from including lunch, dinner and specialty cruises where you can tuck into Swiss fondue by candlelight. While in Switzerland, most travellers are likely to pass through Zurich. There are lots of things to in Zurich and many of them are free. Delving into the history of Chapel Bridge and other bridges is one of the Lucerne things to do for history buffs. In 1400, Lucerne was the only city in Europe to have as many as four bridges. As you walk across Europe’s oldest preserved wooden bridge, the Chapel Bridge, look under the roof for the impressive 17th-century battle paintings on beams along the length of the bridge. Set at the point where the River Reuss flows out of Lake Lucerne and built around the 1300’s, both the Chapel Bridge and Water Tower are recognisable landmarks of Lucerne. Chapel Bridge is connected to an octagonal Water Tower which was once a defence post for the inner city. It was later reinvented into becoming an archive, a city treasury, prison and torture chamber. The bridge isn’t completely original, as a large section was reconstructed after a major fire in 1993. A bit further down the river is another attraction, the Mill Bridge with its series of 67 pictures portraying the Dance of Death painted by Caspar Megliger in the early 17th century. A grinning skeleton leads people from all walks of life – from kings to beggars, merchants to nuns – to their inevitable fate. In the final panel, a majestic Christ vanquishes bony Death. If you’re visiting Switzerland in winter, don’t miss the Witches Festival. For more adventures in the Swiss Alps go here. A walking tour around Old Town Lucerne reveals buildings that are centuries old. 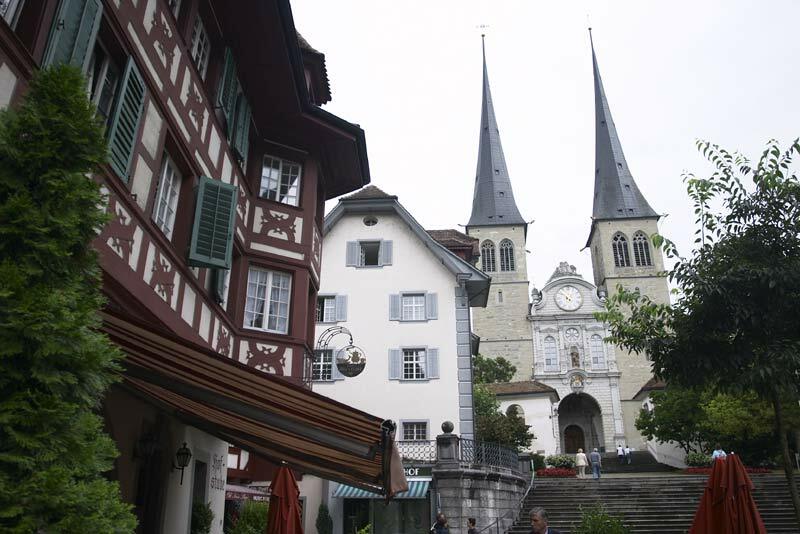 Wander through the old section of town and admire Lucerne’s early architecture. Old town Lucerne has an atmosphere that will make you feel like you’re walking through a fairy-tale. The elaborately painted buildings are eye-catching and each has a rich history. Many of the buildings have the year they were built painted on the front, so you won’t need a guide to explain how old each building is. The three main squares of the old town – Weinmarkt, Hirschenplatz and Kornmarkt – are surrounded by historical houses with colourful frescoes. The open arcade of the Lucerne Town Hall on Kornmarkt still holds a traditional market each week. Visiting Glacier Gardens is one of the things to do in Lucerne to learn about natural history. Discover Lucerne’s lost world at the Glacier Gardens. 20,000 years ago, Switzerland was covered by glaciers. Don’t miss this outdoor museum, which is designed around large natural glacial potholes and boulders in a fascinating display of Switzerland’s natural history. Some of these potholes are around four metres deep and four metres in diameter and were formed by rocks that were trapped inside rapidly flowing ice – proof that Lucerne was covered by glaciers during the last ice age. More amazingly, 20 million years ago, the area was a tropical oasis with a palm beach. Fossilised mussels and palm leaves are displayed to highlight this little-known fact. At the entry to the Glacier Gardens, the famous Dying Lion Monument carved out of rock sits majestically overlooking a pond. Created by Danish sculptor Thorwaldsen, it commemorates the Swiss guards who were killed on 10 August 1792 in Paris while defending the king’s palace at the Tuileries. Travelling with kids? Just need a rest? Mark a ride on the city train down as one of the things to do in Lucerne for easy sightseeing. Rest your weary legs and hop a ride on the mini tourist train for an overview of Lucerne’s sightseeing attractions. The pick-up point is the Hotel Schweizerhof, a grand old hotel located in the centre of town (if you’re not planning to ride the train head there any way for views over Lake Lucerne and the surrounding mountains). The train does a circuit around popular Lucerne attractions and runs uphill to parts of the old Musegg Wall with its elegant towers. Completed in 1408, the sturdy wall forms a defence ring around the city and is almost entirely intact. Three towers are open to the public – Schirmer, Zyt and Männli. It’s not just the places to visit in Lucerne that are attractive. The events and festivals are amazing too. Soak in some culture at one of the numerous festivals held throughout the year. The most renowned is the Lucerne Festival held in August each year; it is patronised by world-famous orchestras and conductors. While there is a concert hall that seats 1800 people in the Lucerne Culture and Convention Centre, Lucerne’s natural historic backdrop adds a rich atmosphere to outdoor performances so seek out an open-air concert or a play. What to do in Lucerne? Make sure to visit a few of the city’s excellent museums. The Rosengart Collection has a large collection of works by Paul Klee and Pablo Picasso. There are 125 paintings, including watercolours and drawings from all periods of Paul Klee’s life. Major works by over 20 masters of the 19th and 20th centuries, including Cézanne, Monet, Matisse, Braque, Léger and Miró hang on the walls at the Rosengart. Sit back and enjoy some amazing aerial photography of Switzerland in the Swiss Transport Museum’s an IMAX Theatre. Classical music fans will love visiting the Richard Wagner Museum. It was once the residence of composer Richard Wagner and houses, among other artefacts, an exhibition of ancient musical instruments from Europe, Africa and Asia. If you’re a museum buff it is worth purchasing a Swiss Museum Passport which offers free entrance to 380 Swiss museums and most of Lucerne’s museums. In the 8th century, a Benedictine monastery was founded at the site of the present church. Today, it is the main cathedral for the city and the most important Renaissance church in Switzerland. The carved doors at the entrance depict the patron saints of Lucerne – St. Leger and St. Maurice. The church is well known for its organ, one of the grandest and largest in Switzerland with 5945 pipes; when played it can reproduce the sounds of rain, thunder, and hail. There are several day trips from Lucerne, however, Mount Titlis is one of the most impressive. Sip on a drink at the highest bar in Europe. For that experience, you’ll have to catch a train to Engelberg which is around one hour from Lucerne. From Engelberg, the Mount Titlis winter wonderland can be reached via a gondola ride to Trubsee, followed by an aerial cable-car to Stand and finally the Rotair revolving cable-car to the summit. At 3020m high, you’ll get a 360-degree panoramic view from the first revolving aerial cable car in the world. This is one of the top day trips from Lucerne.